For almost five years Amizade volunteers in Tanzania have been working on clean water initiatives. Along with our community partners, Mavuno, WOMEDA, and FADECO, Amizade volunteers have successfully installed rain water harvesting systems in the region. To date, because of Amizade’s work, 13 survivors of gender-based human rights abuses and their families now have access to clean water and 16 other families in the Karagwe district have family water tanks. Additionally, in the summer of 2010, Amizade helped to complete a tank that will bring clean water to over 300 school children. Access to clean water, provided by these rainwater harvesting systems and tanks, means that women and children in the Karagwe community do not have to spend hours each day walking long distances to collect water for cooking, cleaning, and drinking. Because of the regular access to clean water, these hours can now be spent going to school or starting a small business. These tanks have gone along way to help in the global effort to provide clean water to all people. Help us continue to provide rainwater harvesting systems to the community of Karagwe by donating to help build new tanks and provide water to more and more people. Each tank costs $3,500 and every dollar helps us get there. 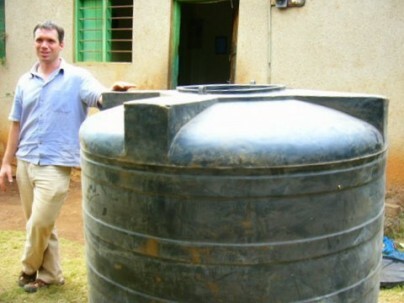 Build a water tank in Tanzania and help bring clean water to the community!